Old Or New? Try Both. While it’s safe to say that just about anyone reading this has a strong appreciation for automobiles, us car enthusiasts tend to be a pretty varied bunch. Some of us like cars from a certain brand, or with a certain type of drivetrain layout. Some like cars made for the race track; others like cars built to cruise in comfort and style. But if there’s one thing that separates our tastes more than anything else, it might the age of the cars in question. Call it the automotive generation gap. On one hand you’ve got the old school crowd – the people who don’t just appreciate, but worship the simplicity and rawness that older cars bring. Oftentimes these people won’t be caught dead working on a car with high-tech gadgets and complicated computer systems. 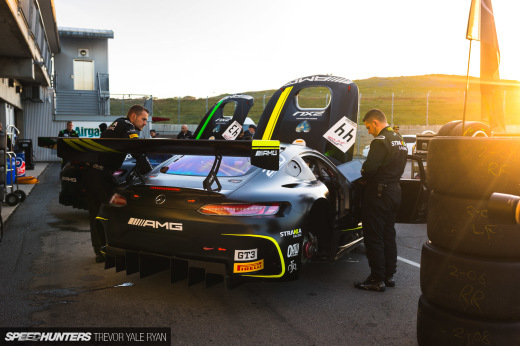 Then there’s the new school crowd – an often younger generation who has fully embraced the technological advances that make modern cars what they are. Some of these people have zero experience with ancient technology like carburetion and even the manual transmission. But for as big as this generation gap can be, there’s also a large group of enthusiasts who are completely comfortable and adept at enjoying both the old and the new. John Sarkisyan is one of those people. Last month we took a look at John’s beautiful Porsche Speedster Outlaw powered by a hopped-up, air-cooled VW engine and dripping with vintage style. But the old school Speedster is far from the only vehicle he’s modified. In addition to playing around with air-cooled VWs and Porsches, John is also fan of more modern European machinery. And that brings us to his very distinctive Mercedes-Benz CLS. 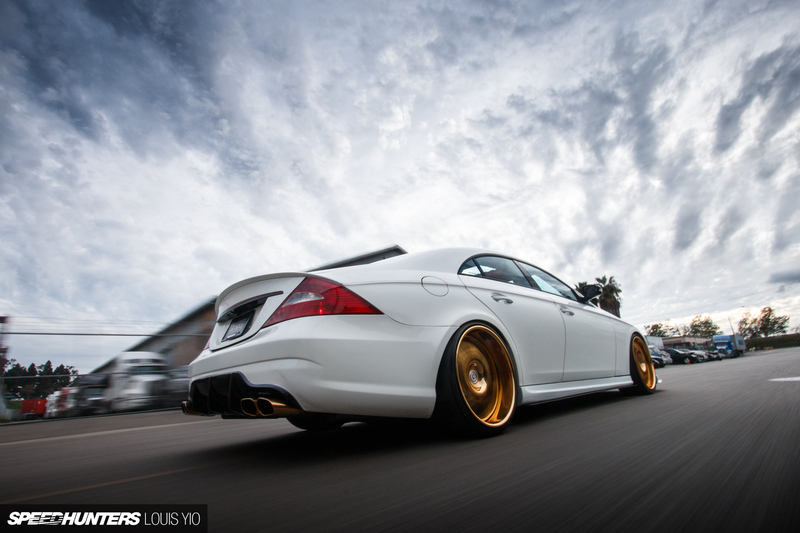 John has been a fan of the W219 chassis CLS since he first laid eyes on it. In fact, about a decade ago he purchased a brand new CLS63 AMG which he promptly outfitted with custom wheels and interior, some performance upgrades and so forth. He eventually had to part ways with his first CLS, but John just couldn’t shake his love for the W219 body style. 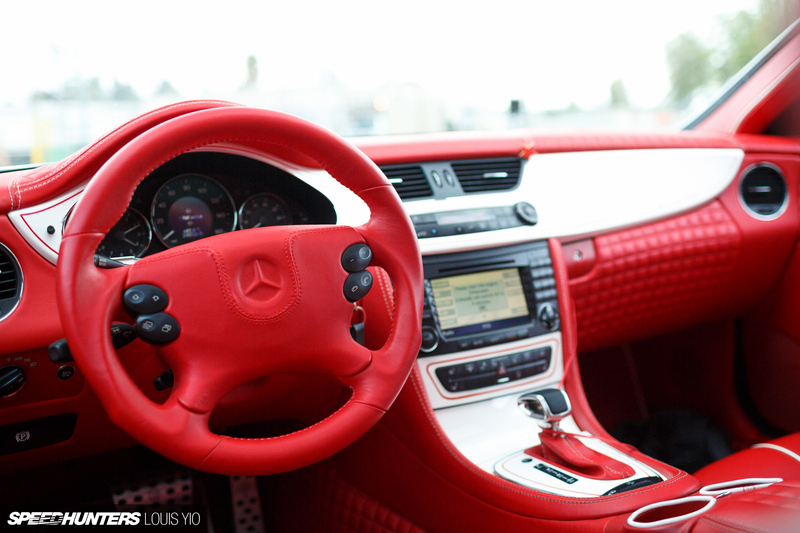 A few years later he bought this one – a more basic CLS500 which he decided to go even crazier with. It took less than a year to get the car as it looks right now, with much of that time being spent on the paint, bodywork and interior. The CLS was originally painted in luxury car typical silver-tan hue, but John’s plans called for the car to be fully repainted in two-stage pearl white from the Lexus catalog. 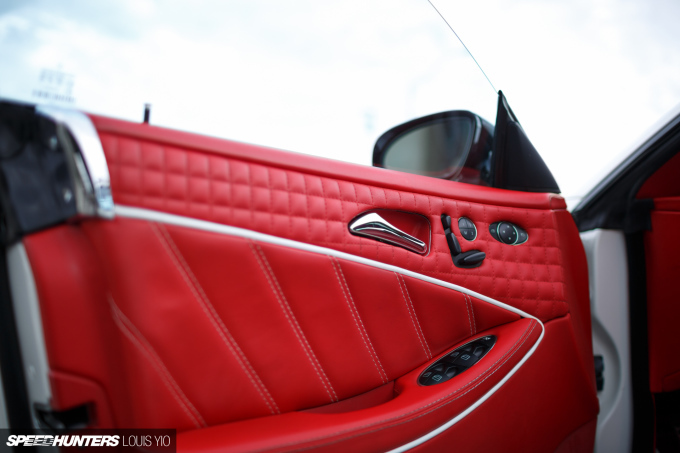 In addition he also added a racing stripe in the style of the Ferrari 599 GTB Fiorano, finished in a gorgeous red metal-flake. Custom red pinstriping was also done to add even more character to the car’s swooping lines. 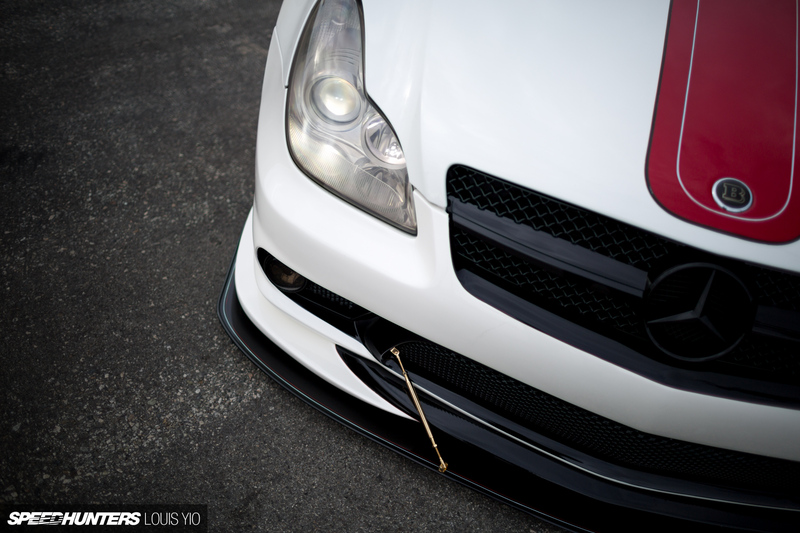 The body modifications themselves include a custom shaved AMG front bumper with a Carlsson lip and a one-off splitter from AeroFlowDynamics. Out back there’s a Brabus three-piece spoiler to match the Brabus side skirts and an AMG rear bumper has been modified to fit an SL65 diffuser. 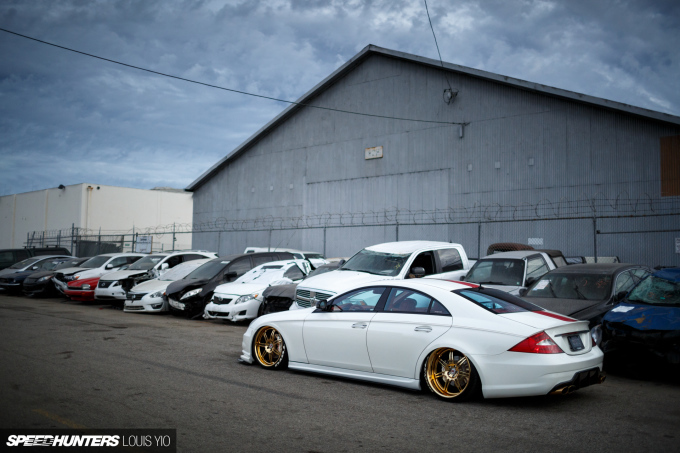 Needless to say, the CLS was also fitted with air suspension for maximum slam; more specifically a setup from Shin at Air Runner USA with ride stiffness that can be adjusted from inside the car. The wheels are HRE 891Rs sized 20×10-inch up front and 20×12.5-inch in the rear, and that would be pretty impressive on its own. 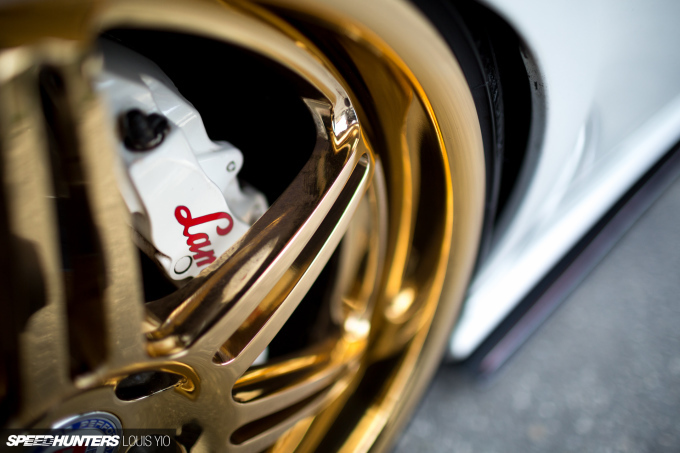 But John went even a step further and had the wheels plated in 24 karat gold with zinc coating to ensure they can stand up to the elements. Visible behind the spokes of the front HREs are a set of Lamborghini Gallardo/Audi R8 brakes, while the rear brakes have been upgraded with AMG components. All the calipers have been painted in the same mix of pearl white and red seen on the rest of the car. But it might actually be the interior that’s the most impressive. The CLS was in the shop for over eight months having its cabin completely overhauled. 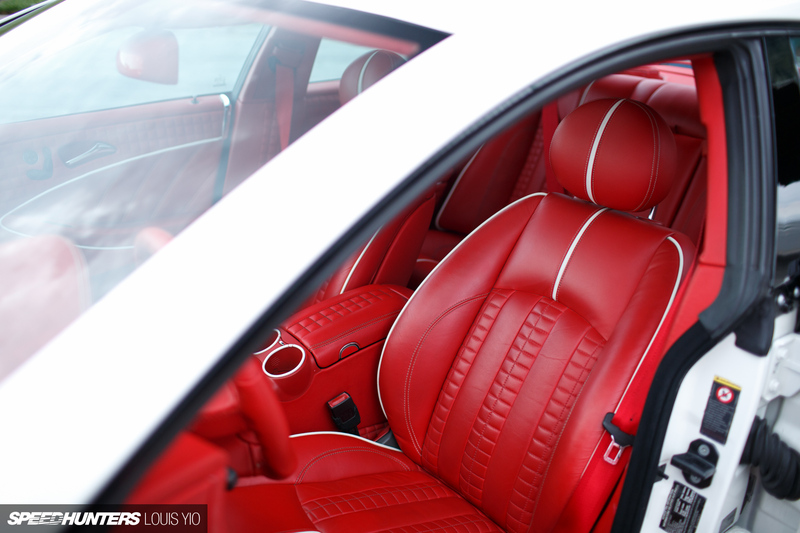 There is no stock coloring left anywhere, with everything finished in custom red upholstery and the original wood surfaces redone in a pearl white to continue with the overall theme. 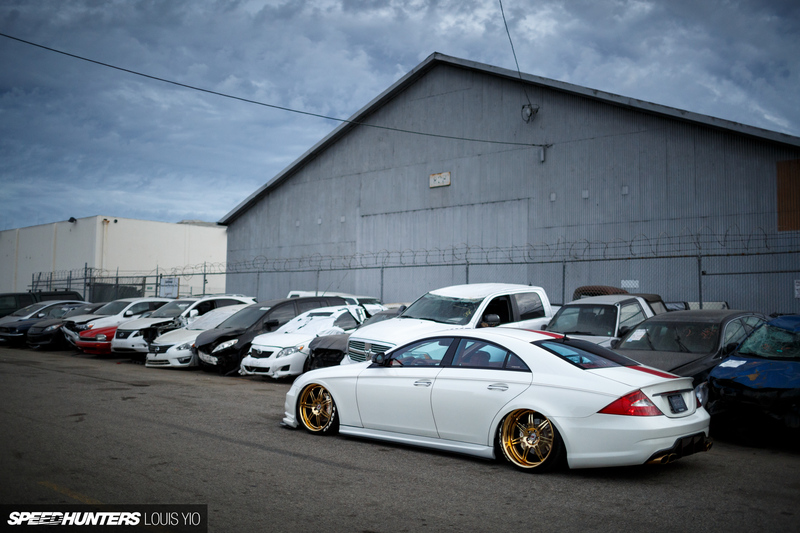 When it came to redoing the CLS’s trunk, John took lots of inspiration from the wild VIP builds from Japan. Everything has been refinished with custom red upholstery, including the air tank and housings for the JL audio equipment. A skateboard deck has even been integrated into the deck lid. While a driving a stock Mercedes CLS might be an end goal for many people, John has gone much further, using the car as a basis for one of the more unique VIP/luxury builds we’ve seen in a while. Whether it’s a classic air-cooled machine or the latest and greatest in modified luxury style, John is someone who has thrown the generation gap out of the window. Old or new? Why not have it both ways? Not a big fan of the interior. Reminds me of the Lancer from the recent MCM videos. Otherwise it looks pretty nice from the outside. I love these CLS'.....but I agree, the interior is a bit more on the side of tacky, rather than classy....still nice though! What's with the spray cans in the trunk? wait...does the skateboard deck have wheels? Can you actually ride it with the tufting or is that a graphic? I got dizzy with all the "bling" "bling".lol its a little too much yo! just up to my gaudy limit....I like it. The gold wheels work, the white, the racing stripe...it fits. once again...the white letters on the tires kill me, I still can't rock with em. How much did this guy do himself compared to how much he paid to other people? Your article skips that point. Nice car but if hes some rich dude who paid for all this stuff than who cares. Has a new school rat rod feel with the mixing of parts so i want to like it but unless this guy did the work i say malarkey. I thought this car looked familiar. It's for sale if anyone wants it. That Porsche of his is for sale on there too. Reminds me of Japanese VIP cars just without the fusa knott. BigTmoneyD He is the same man that built the Outlaw 356 we featured back in March. BigTmoneyD Why does that matter? How many people do you know sit there and cut, sew, stitch, fill etc... all their own interior pieces? I don't know anyone unless that is their profession and apply those skills to their own build. Seems like a cheap shot at trying to call someone out. Either way even if it was a huge engine build why does it matter if he paid someone else to build his own envision? Ok, fine, but WHAT'S UP WITH THE SPRAY CANS?!?!?! That's not a criticism. I just really want to know. 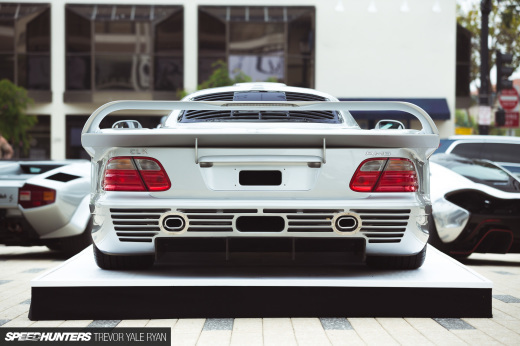 I like the understated look to this Merc. Kinda sleeper. Blends into traffic type whip. dovvv did you miss the part that said he also owns a hopped up air cooled porsche? I did have a lot of performance parts, AMG intake, eisennmann exhaust, or Tunning ecu upgrage, shorty headers and a few other things. I sold the cls63 because I had 28 citations in 11 months, and it was also a cover car for heavy hitters and a few more. I ruined my interior? U obviously have no taste or any money! Final sale price was way higher than what u saw, I wouldn't sell it for that. Thanks to all for the great comments, btw spray cans are in the trunk because I'm an artist and aerosol is what I mostly use. and the last photo........... so why isn't that, clearly driveable height, not enough for folks anymore? Slang500 "U obviously have no taste"